While I absolutely love and worship cooking for leisure and sharing, I'm not going to lie- I would be just as happy if I had someone cook for me all the time and all I had to do was show up. But when I ended up being a part of a pop-up restaurant and playing the role of the chef last month, it turned out to be an unbelievable personal experience. I cooked every minute of it, and absolutely loved it. What was a chance conversation with Thomas Kueber, my manager at work spurred this idea and we decided to start a pop-up restaurant where I’d cook and he’d do the drinks. With Diwali around the corner, we decided to host a festive little fare to celebrate our beloved festival. Here's sharing the experience and the few pictures we have from friends- since we didn't manage any time to take any pictures ourselves! Karthik's elf-ery started earlier in the day with wrapping up little goodie packets of coconut barfi and orange-spice tea biscuits I made for the guests to take home. He also carved wonderful pumpkin centerpieces for large diyas, decorated with flowers. As night fell, Karthik and Thomas brought the room alive and together lighting dozens of little lamps. And so it began! Thomas opened the fare with the prettiest little aperitif inspired by aam panna. It was a beautiful sparkling wine packed with a little surprise of cumin-seasoned frozen mango that got more and more delicious as you sipped. They looked like works of art as he was preparing them- if only I had more pictures from that moment! For the big thali that was to follow, we came up with what we thought would be a nice blend of dishes reflective of our Tamil/Telugu kitchen and Thomas curated drinks that were practically singing to each of the courses. Puliyogare (tamarind rice) with spicy potato roast; paired with Spent's Weizen Wit, Belgian wit beer. Okra masala and pumpkin sambar served with rice and paired with The Bruery's Autumn Maple. Black Pepper Chicken / Pepper Paneer served with rice and paired with Mashsee Trainingslager. Curd Bath with gooseberry pickles. And a masala Chai to finish! The Curd Bath with gooseberry pickles. It was quite the cooking marathon, and our dear friend Vinay Seshadri who dropped in for the event quickly became my chopping-tasting-cleaning cheerleader and the biggest helper that probably ever was. Thanks so much Vinay, I could not have done this without you! 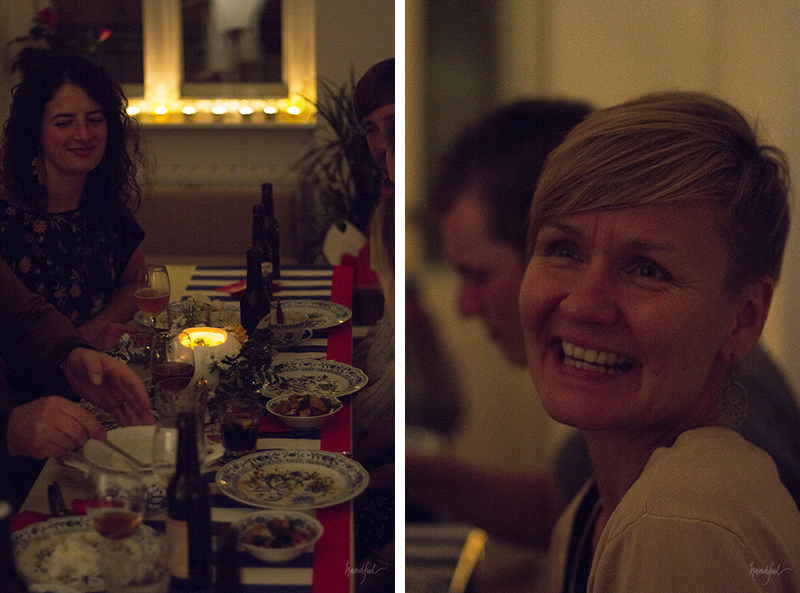 And finally, this wouldn't be complete without talking about the indulging lovely people who came. Since it was a big meal, I did not have a lot of time to spend with everyone, but did get a chance in the end to go around and say hello. And may I add, they were the sweetest guests ever! While I was away chatting with a few, the rest sneaked into my tiny little kitchen and cleaned up the entire place as if it were their own. I came back to the kitchen to find it looking like nothing had even occurred there- pleasantly taken aback and also a bit embarrassed! Thank you, kind folks! Such a wonderful experience and I can't wait to do it again, and better!